Learn more about Musical U, how it works, what’s included, and what it can do for you in your musicality training. 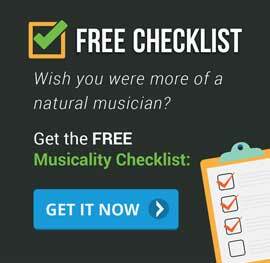 Every musician is different, with their own background and their own true goals. A “one size fits all” course can never hope to match up. A “course” is structured as a fixed straight line – and we all know real learning never works like that! There’s normally very little support or guidance available if you get stuck partway through the course. So at Musical U we don’t believe in one-size-fits-all “courses” for music training. Instead we have developed a fully flexible training system which provides all the training modules you need, planning tools for defining the goals that truly mean something to you, and construct a personalised step-by-step plan for reaching that goal. And then the team is there to support you, every step of the way. to suit your own interests, needs and abilities. Musical U Roadmaps provide the “big picture” view of how you can learn particular musical skills like playing by ear, improvising and creating your own music. Learn the vital skills required to set effective and inspirational goals, and how you can construct a plan to accomplish them. Pitch is how high or low musical notes are. That means your sense of pitch is fundamental to almost everything you do in music. Intervals are the building blocks of melody and harmony in music. Learning to recognise intervals builds a strong foundation, your sense of “relative pitch”. A series of notes one after the other creates a melody. Melodies are what we think of as the “tune” but the same skills also apply to basslines, solos and accompaniment parts. Whenever three or more notes are heard together, it forms a chord. Different types of chord create different musical moods and emotions. A series of chords is called a progression. Chord progressions create the harmonic movement that creates a story in music. Rhythm is the pattern of sounds and silences in music and gives music its energy and pace. Improve and refine your natural sense of rhythm with training. Playing by ear means using your learned listening skills to play a song directly on your instrument (or write it down) after just hearing it. Develop an accurate and reliable singing voice and use your voice to train your musical ears. Play a different instrument? Musical U can help you too. Just explore our Training Modules and Roadmaps above to get an idea of everything you could learn inside. Musical U Instrument Packs are an optional membership upgrade which offer instrument-specific training to help you apply the core musicality training to a particular instrument. Currently available for: Guitar, Piano/Keyboard, Bass and Singing. Learning to recognise chords and chord progressions by ear is powerful for almost any kind of musician. It can help guitarists play songs by ear, it can help bass players figure out how to play a bassline for a song, it can help instrumentalists of all kinds to improvise and play melodies by ear. Developing your musical ear starts with improving your sense of relative pitch, and interval recognition is a great way to get started. Most musicians wish they could improvise but many don’t even know where to start. Those who do get started often find themselves trapped in just playing up and down scales robotically. By studying the true skills of improvisation at Musical U you can escape this trap and learn to easily express your own musical ideas on your instrument. Singing is important for all musicians, whether or not you ever intend to perform, but concerns about singing off-key often hold them back. And even devoted singers sometimes worry that they’re singing out of tune. By studying pitch fundamentals and singing skills at Musical U you can get real control over your voice and become a confident singer.